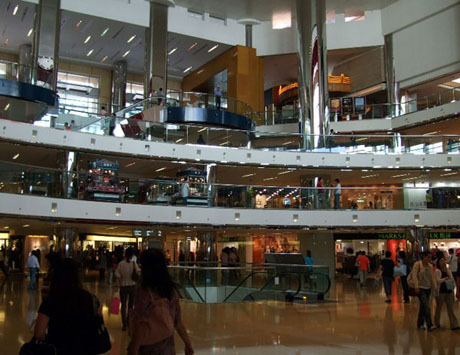 Hysan Place, which opened on 10th August 2012, is the first new major shopping mall on Hong Kong Island since the completion of IFC Mall in Central District in 2003. The mall, which took six years to construct, forms part of a 36-storey office and retail development by Hysan Development Company Limited on the site of the former Hennessy Centre which was demolished in 2006, and was location of former Mitsukoshi department store. Retail space (shops and restaurants) occupy 17 floors with a floor area of about 270,000 sq ft. Hysan Place forms part of Hysan Development’s Lee Gardens “concept zone” in Causeway Bay which includes Hysan’s long standing retail developments Lee Gardens One & Two, Lee Theatre and Leighton Centre. 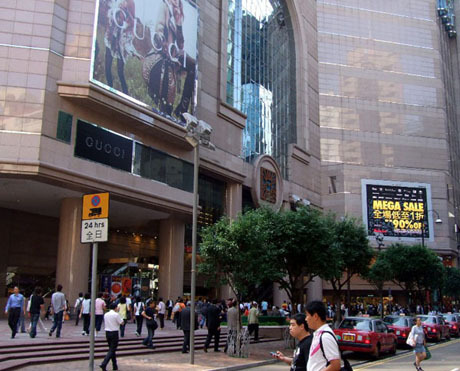 About 120 shops operate in the mall and whilst many of the shops are familiar names, the mall also houses some international brands which have not previously had outlets in Hong Kong. 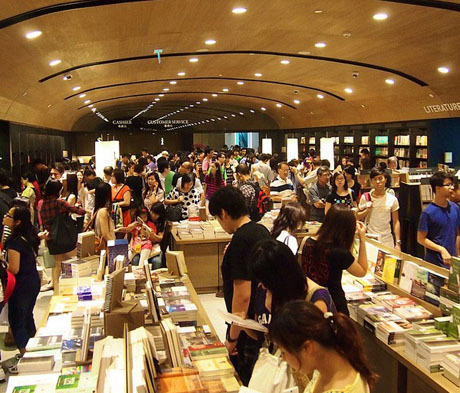 These include the first overseas branch of Taiwanese bookstore Eslite, which is now Hong Kong’s largest bookstore, occupying 41,000 sq ft of space on the 8th, 9th and 10th floors. The store which includes coffee shops, MOMA boutique, natural and organic store 10/10 Hope, art galleries and exhibition areas is Hong Kong's became Hong Kong's first 24-hour bookstore, opening round the clock from Thursday to Sunday night on a trial basis when it opened but has since curtailed its closing time and now closes at 11pm daily but from October 2012 will extend its closing time to 2am on Thurdays to Saturdays and on the eve of public holidays. The fourth floor features Japanese fashion where shops include Deicy, Shel’tter, NINE, Language and Double Standard Clothing. The seventh floor has mainly shoe shops which include Trippen, Korean brand iiJin and Japanese Mode et Jacomo as well as the more familiar Dr Martens. T Galleria (Traveler’s Galleria), operated by global luxury goods chain DFS Galleria, occupies two floors at ground and basement one level selling a range of beauty products, watches and jewellery. Other shops include Accessorize, Agatha, City Chain, Crabtree & Evelyn, DKNY, French Connection, GAP, Lens Crafters, Links of London, Max and Co, Rolex and Tudor, Swarovski, TOUS and Vivienne Tam. Jason’s supermarket occupies basement level 2 and includes European-style Urban Bakery, Starbucks, XTC Gelato counter, a branch of ramen chain Baikohken and a sushi counter operated by long-established Nakajima. Hong Kong's third Apple Store opens at Hysan Place in mid-December 2012 and Hollister opened its second Hong Kong store on the second and third floors in early 2013. The eleventh floor houses a food court with a wide variety of outlets including Izumi Curry, Pepper Lunch, Triple O’s, Hokkaido Dairy Farm Milk Restaurant, Kim’s Gourmet and Honeymoon Dessert. Western and Asian restaurants located on the twelfth, thirteenth and fourteenth floors include Amaroni’s Little Italy, French Le Salon Restaurant et Croisanterrie where celebrity chef Tony Cheng Shai-yin creates French bistro classics as well as an exotic range of croissants, Japanese and Korean restaurants Rasupermen, Shiro, sen-ryo and Wired Café, BB1 Vietnamese Bistro, Ho Hung Kee Congee and Noodle Shop and Chinese restaurants Red Almond, The Dining Room and The Sweet Dynasty. 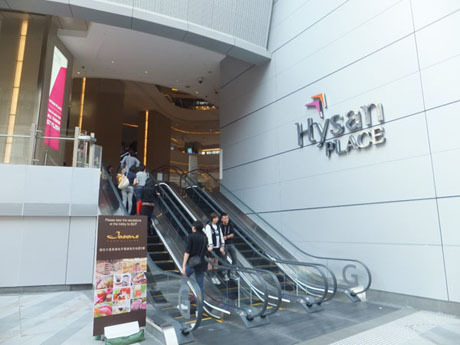 For complete list of shops and floor plan see Hysan Place website (details below). A landscaped Sky Garden on the fourth floor and Terrace Garden on the seventh floor allow shoppers to relax in open green space. The mall is equipped with high-speed lifts and Express Escalators. Services include loan of mobile chargers, wheelchair loan and free wi-fi. Shops – Sunday to Thursday 10am to 10pm (until midnight until 25th August 2012). Fridays, Saturdays and the eve of public holidays 10am to 11pm. Eslite bookstore opens 24-hours on Thursdays, Fridays, Saturdays and to midnight on Sundays on a trial basis until 16th September 2012. Opening hours of some shops may vary. MTR - The mall is directly connected to Causeway Bay MTR (Island Line) Station, Exit F2. BUS – Bus routes 2A, 2X, 8P, 11, 23, 23A, 25, 25C, 38, 42, 42C, 65, 72, 72A, 77, 96, 108, 112, 116, 968 592, E11 all stop either near Sogo Department Store on Hennessy Road or on Yee Wo Street. TRAM – Trams travelling through Causeway Bay along the main tram route pass Hysan Place on Hennessy Road. The nearest tram stops are eastbound stop 51E (Percival Street) and westbound stop 48W (Paterson Street). Located between One IFC and Two IFC Towers above Hong Kong Station this mainly high-end shopping mall which opened in 2003 is owned by a consortium led by Sun King Hai Properties. The mall has over 200 shops on four floors (podium levels 1 to 4), supermarket, cinema, café’s, restaurants and roof garden. The range of goods offered by shops includes fashion, jewellery and accessories, home appliances and electronics, personal care and beauty, travel accessories, books, arts and gifts. Major shops include Lane Crawford, Agnes b, Brooks Brothers, Burberry, D&G, Gieves and Hawkes, Kate Spade, Mango, Zara, Swarovski, Alexandre Zouari Paris, TOUS, Clarins, Clinique, Estee Lauder andThe Body Shop. Dymocks closed its flagship bookshop in IFC Mall in February 2015 and is terminating its operations in Hong Kong. Its remaining stores will continue to operate under the Dymocks name until expiry of existing contracts and will then operate independently. Canada's largest fashion shoe retailer Aldo Group which has over 1400 stores worldwide opened its flagship store in Two IFC in May 2009. 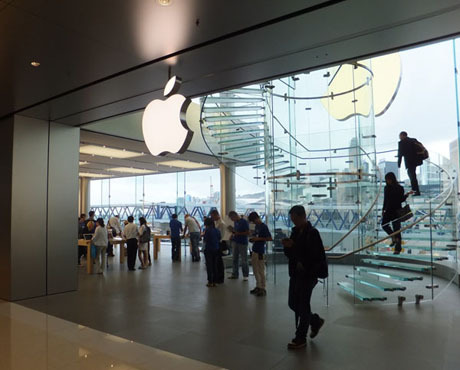 Hong Kong's first Apple Store opened in the mall in September 2011 and German fashion retailer Hugo Boss opened a new store in October 2011. City’super is an upmarket supermarket with a good range of international foods and there are cafe’s and restaurants are on all levels and range from McDonalds and Starbucks to TWG Tea, luxury teahouse and retail shop to high-end restaurants including Inagiku Japanese Restaurant, Lei Garden and RED bar and restaurant. Podium Level 4 has a public roof garden with excellent views of Central Ferry Piers and Victoria Harbour. Palace IFC Cinema is Podium Level 1. Four Seasons Hotel is located at the One IFC end of the mall. For directory of shops and restaurants see the IFC website. OPENING HOURS – vary between shops but opening times are mostly from 9-30am to between 8pm and 10pm every day. Some cafés and restaurants open from as early as 6-30am until midnight. For opening/closing times of individual shops see the mall website for store directory (details below). Some passages through the mall are open for public access 24 hours. GETTING THERE – The mall is located above Hong Kong Station (Airport Express and MTR Tung Chung Line) from where there is direct access. Exchange Square Bus Station is located about 2 minutes walk from the mall. Hong Kong Public Transport Interchange Bus Station is about two minutes walk via elevated walkway from exit E1 underneath Four Seasons Hotel. Central Ferry Piers are about 5 minutes walk via pedestrian bridge and escalators from podium level 1 exit next to City’super supermarket/Ben & Jerry’s and Star Ferry is about five minutes walk by elevated covered pedestrian walkway. Covered walkways from the Podium level 1 also connect with the Central all-weather pedestrian walkway system. Central Macau Ferry Pier at Shun Tak Centre is about 10 minutes walk by elevated pedestrian walkway from exit E1. OPENING HOURS – Opening hours vary from between 10am/11am opening to 7pm/8pm closing 7 days a week. For individual shop and restaurant opening hours see the store directory at the above website. GETTING THERE – MTR Central Station exit G leads to The Landmark. 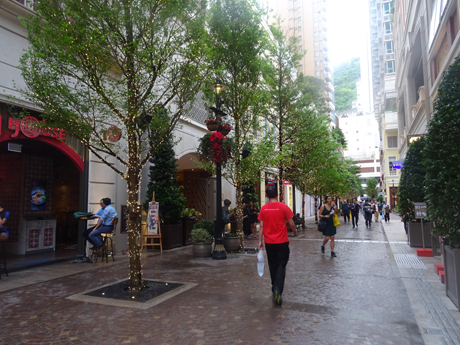 The Landmark also is served by the Central all-weather pedestrian elevated walkway system and is about 5 minutes walk from Hong Kong Station and Exchange Square Bus Station or 10 minutes walk from Star Ferry Pier via walkways. Also - most buses travelling on Des Voeux Road Central and Peddar Street stop outside or opposite The Landmark including routes 1, 5, 5B, 10, 23A, 26, 40M, 101, 104, 109, 111, 113, 115, 182, 720, 788,. All trams to and from Western Market and Kennedy Town stop on Des Voeux Road Central outside The Landmark. Pacific Place Mall opened in 1989 and is part of a large complex developed and owned by Swire Properties which includes three office towers (One Pacific Place, Two Pacific Place and Three Pacific Place) and three hotels (JW Marriott, Conrad and Island Shangri-La). In recent years the owners have increased rents and forced out tenants of “mid-range” businesses taking the mall more “up-market”. In 2007 Swire Properties began a HK$2 billion "contemporisation" programme to upgrade the complex which will be completed in 2011. The mall occupies five levels with shops located on Levels 1, 2 and 3 whilst the Lower Ground Level (Basement) has a food court and supermarket. Level 4 comprises the entrance level of the three hotels and serviced apartments. The range of goods includes mens and ladies fashion, children’s wear, shoes, bags and leather goods, sports shops, jewellery, health and beauty, books, music, electronics, arts, home goods and gifts. 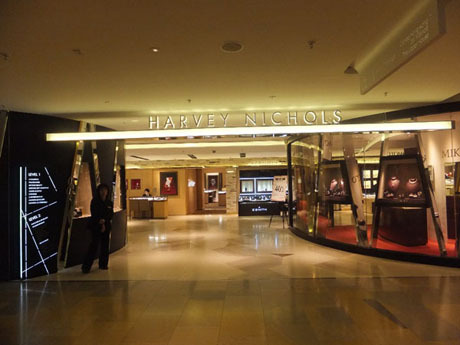 In October 2011 Dickson Concepts opened Hong Kong's second Harvey Nichols store on levels 1 and 2. 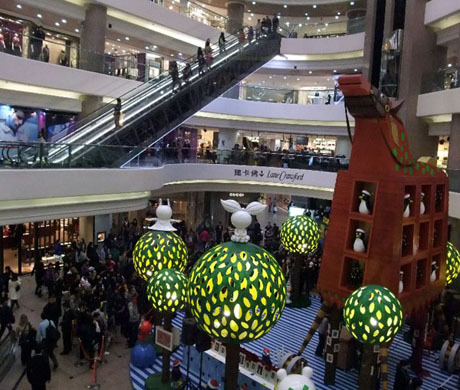 The 83,000 sq ft store, costing HK$150 million replaced Seibu, which was also operated by Dickson Concepts who operate the Harvey Nichols store at Landmark in Central. In February 2012, the mall's flagship store Lane Crawford vacated Pacific Place and moved to the opposite side of Queensway where it opened a "concept store", Lab Concept on May 2012 at Queensway Plaza above Admiralty Station. It has been replaced in Pacific Place by Burberry. In October 2012 luxury watch brand IWC Schaffhausen opened a boutique shop in the Level 3 Watch Gallery. Level 1 shops include AIX Armani Exchange, French Connection, Mango, Zara and Links of London. There is also a cinema AMX Pacific Place on Level 1. Level 2 shops include Aquascutum, Joyce, Shanghai Tang, Coach, Kate Spade, Crabtree & Evelyn and Chinese Arts & Crafts. Shops on Level 3 include Bally, Chanel, Chloe, Dior, Gucci, Hermes, Prada, Versace, Cartier, Tiffany & Co and Bvlgari. Restaurants in the food court include Dan Ryan’s Chicago Grill, Thai Basil, Zen Chinese Cuisine and Roka – Japanese Robata Grill. Cova and Ye Shanghai restaurants are located on Level 3. Lower Ground Level has an upmarket supermarket grEAT. For directory of shops and restaurants see the Pacific Place website. OPENING HOURS – Vary from shop to shop but mostly from about 10am/10-30am to 8pm/8-30pm daily. See website above for opening hours of individual shops. GETTING THERE – MTR Admiralty Station exit C1 then cross enclosed pedestrian footbridge over Queensway to Pacific Place entrance Level L1 or take exit F which leads to Pacific Place Level LG via subway. Admiralty Bus Station is opposite Pacific Place and numerous bus routes stop on Queensway outside or opposite Pacific Place including 1, 5B, 6, 6X, 10, 23, 23A, 25, 111, 113, 115, 260(eastwards), 681, 690, 960, 961, 962, 968, 969, A11(eastwards), E11. All trams to and from Western Market and Kennedy Town stop outside Pacific Place on Queensway. Pacific Place is also accessible from Hong Kong Park via escalators opposite the park’s Supreme Court Road entrance. 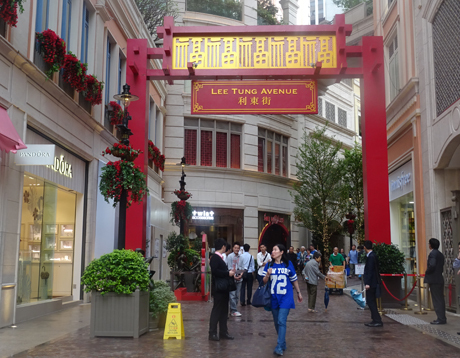 Lee Tung Avenue, a new shopping precinct opened in March 2016, is part of an HK$8 billion Urban Renewal Authority (URA) project for redevelopment the former Lee Tung Street, popularly known as "Wedding Card Street" and surrounding area, which includes about 1275 luxury residential apartments as well as themed shopping area. The redevelopment has been carried out by a consortium comprising Hopewell Holdings and Sino Land together with the URA. The intention has been to preserve as far as possible the cultural heritage of the area and the 100, 000 square-foot shopping precinct contains three-storey "tenements" with about 70 shops modelled on nearby historic tenements and a culture gallery. It had been expected that about half the shops would be wedding related but in the event, only ten of twenty-seven former tenants have returned owing to high rent and the precinct mainly comprises fashion, leisure and cosmetics shops as well as dining outlets. Wedding shops include Forever Couple, H2 Cards, Lucky Blossoms and Pandora and other shops include Vivienne Tam, Staedtler, Thermos, Le Creueset, Moleskine, Lafuma and Catalo. Dining outlets include Yuan Yang Cafe, Brook's Cafe, Omotesando Koffee, Gourmet, Passion by Gerard Dubois and Blue Brick Bistro. GETTING THERE - The main entrances to the precinct are from Johnston Road and Queen's Road East. Nearest MTR station is Wan Chai, exit A3 (about 60-metres), Hong Kong Tramways Swatow Street stop (westbound) or Luard Road stop (eastbound), numerous bus routes stop on Johnston Road and Queen's Road East within short walking distance of Lee Tung Avenue including Citybus/NWFB routes 37B, 37X, 75, 90, 97, 590A, 6, 6a, 6X, 10 and 15. Times Square which was opened in 1994 is built on a former tram depot and is owned by The Wharf Holdings who operate Hong Kong Tramways and the Star Ferry amongst many other interests. 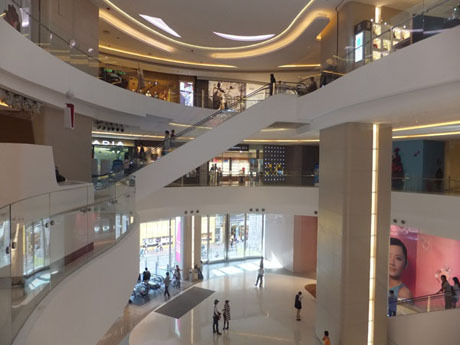 This is a "vertical mall" with fourteen floors and two basement levels with a wide variety of retail shops, supermarket and cinema and four floors comprising a “Food Forum” with café’s and restaurants. Floors from ground level up to level 8 are built around a large atrium with escalators and glass-sided lift. There is a giant external video screen and piazza outside the main entrance where exhibitions are often held and which is one of the main venues for (western) New Year celebrations. 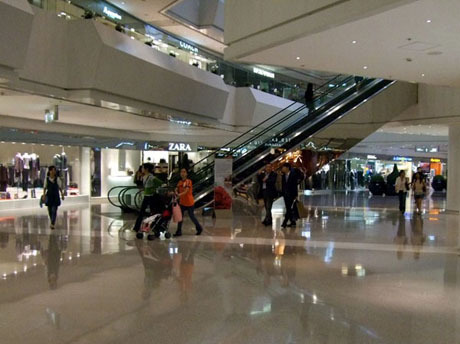 There are over 230 shops and the flagship store is Lane Crawford on ground level and level 1. Ladies and mens fashion shops, leather goods and jewellery shops including MaxMara, Burberry, Zara, Aquascutum, Vivienne Tam, AIX Armani Exchange, Ben Sherman, Gant, Anna Sui, Gucci, Bally, Coach, Ma Belle and Follie Follie are mainly on levels 2 to 7, sports and casual wear stores including Tommy Hilfiger, French Connection, Timberland, North Face, Marathon Sports, Nike and Puma are on levels 5, 6 and 7. Marks and Spencer have a menswear shop on level 4 and ladieswear, gift, food and wine shop on level 6. Levels 7 and 8 have a number of computer, home appliance and electronics stores including Fortress, Broadway, Bose and Gome. Page One, a popular bookstore on the ninth floor, closed in February 2015 ahead of renovation of this floor. However, the Philippines largest bookstore chain, Metrobooks, opened its fourth local store taking up 5000 sq ft of space on the ninth and tenth floors in December 2015. Basement level 2 houses quick-service restaurants including Bistro Delifrance, Haagen Dazs and two extremely popular Japanese restaurants Genki Sushi and Watami where queues often form. The Food Forum on levels 10 to 13 has more “up-market” restaurants including Modern China Restaurant, SimplyThai, Shark’s Fin City, Arirang Korean Restaurant, Golden Bull Vietnamese Restaurant, Oceanna, WasabiSabi and Japanese Dining SUN. A pair of “semi-circular” escalators serve City’super supermarket located in basement level 1 and there also a popular restaurant attached to this supermarket. UA Times Square Cinema, which was located on the ground floor, closed at the end of January 2012 and is to be replaced by a new cinema complex on the 12th and 13th floors. During 2009 the mall received a "facelift" and additional escalators were installed allowing shoppers to "skip" floors and make a faster upwards or downwards journey through the mall. For full directory of shops and services see Times Square website. OPENING HOURS – vary from shop to shop but generally from between 10am or 11am to 8pm or 9pm every day. Most restaurants close later. The mall’s website shop directory does not publish individual shop opening times. GETTING THERE – Causeway Bay MTR Station exit A leads via subway to Basement 2 level of Times Square. Trams travelling to/from Western Market, Kennedy Town, Shau Kei Wan, North Point and Causeway Bay stop on Yee Wo Street about 5 minutes walk from Times Square and all buses travelling along Yee Wo Street stop near Sogo department store close to Times Square. 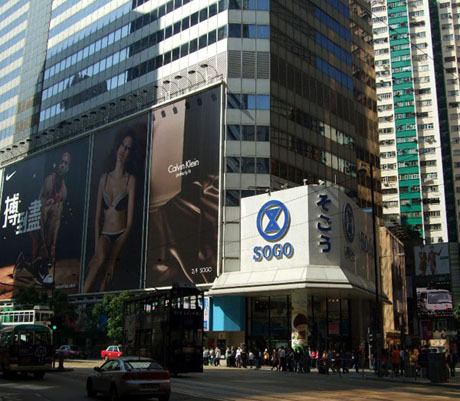 A short walk from Times Square on Yee Wo Street is the huge Sogo Department Store which opened in 1980 and was originally part of Japanese Sogo group. 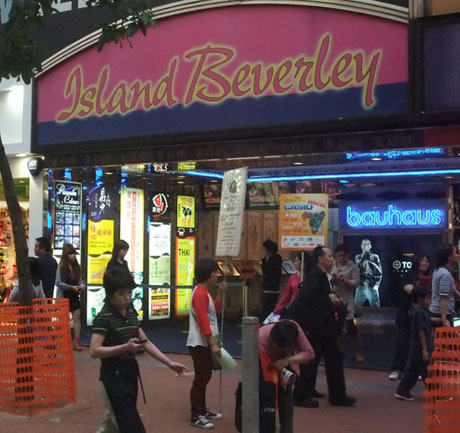 However following collapse of the Japanese group in 2000 the Hong Kong store now operates under franchise owned by the local Lifestyle International Holdings. The store has nineteen retail floors with a large product range and departments include ladies and mens shoes, leather goods, cosmetics, handbags, ladies and mens branded fashion, young casual fashion, sports and leisure, children and babies’ wear, toys, stationery, kitchen appliances, tableware, home living, electrical appliances, travel goods, health care equipment, beds and bedding, books, bridal salons, spa’s and beauty treatment. The ninth floor has a popular Event Hall where bargain sales are held daily and the Basement 2 level contains a FreshMart supermarket and restaurants. There is also a UCC café/coffee shop on the fourth floor. Although the store considers itself “Japanese-themed” most international brands are available here. For floor plan see the Sogo website. GETTING THERE – MTR Causeway Bay Station exit D. Trams travelling to/from Western Market, Kennedy Town, Shau Kei Wan, North Point and Causeway Bay stop on Yee Wo Street. All buses travelling along Yee Wo Street stop near Sogo. 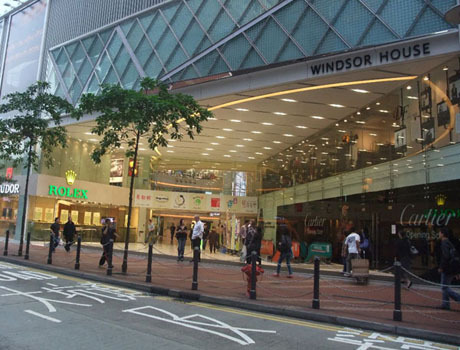 Located in the Causeway Bay shopping precinct at the junction of Great George Street and Gloucester Road Windsor House has recently undergone major renovation. This is a 17-floor mid-range shopping centre owned by Chinese Estates Holdings Ltd. There is a wide variety of shops offering a large range of goods including mens and womens fashion, childrens wear, toys and gifts, personal care and beauty products, leather goods, jewellery, computer and digital products. There are also seven cafes/restaurants and a karaoke box. The centre doesn’t have many international brand name shops but there is a Toys “R” Us store which occupies the whole of the seventh floor. A branch of Fortress, Dymocks bookstore and a Park N Shop "International" branded supermarket have opened at basement level. The eighth and ninth floors are occupied by Red Box and Red Box Plus karaoke rooms and floors ten and eleven are a computer and digital products mall. Food outlets range from KFC in the basement and Pacific Coffee and Freshness Burger on the first floor to Royal Palace Chinese Restaurant on the fourteenth floor. For a full directory of shops see the Windsor House website. OPENING HOURS – shop opening hours vary but most shops open from 10am/11am to 9pm/10pm. GETTING THERE – MTR Causeway Bay Station exit E. Also - trams travelling to/from Western Market, Kennedy Town, Shau Kei Wan, North Point and Causeway Bay stop on Yee Wo Street near Windsor House. All buses travelling along Yee Wo Street and along the Gloucester Road side of Victoria Park stop near Windsor House including routes 15B, 23A, 511, 592, A11, E11, 103, 601, 603, 621, 671, 170, 680, 681, 690, 962, 969. There are numerous other stores in the Causeway Bay shopping area including IKEA and HMV (opposite Windsor House) on Great George Street, Island Beverley Shopping Mall on East Point Road/Great George Street which specialises in young fashion and World Trade Centre on Gloucester Road, which was refurbished during 2009/10. For bargain clothes there is a busy day/night street market at Jardine’s Crescent and Jardine’s Bazaar opposite Sogo and there is a 24 hour Wellcome supermarket on Great George Street. The whole of Causeway Bay shopping area is extremely busy particularly at night time when the brightly lit streets become very crowded. 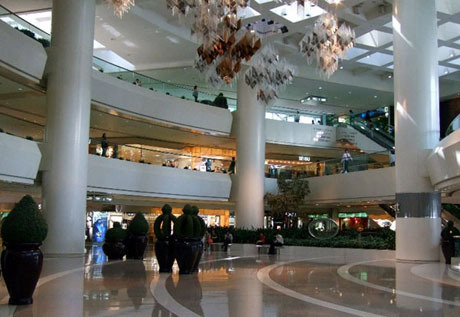 Cityplaza owned by Swire Properties is one of Hong Kong’s largest shopping malls and the largest on Hong Kong Island. Located just off King’s Road at Quarry Bay on the north-east side of the island it has been developed in phases since 1982 with the shopping mall located in phases 1 and 2 with phases 3 and 4 comprising mainly office space. The mall underwent renovation in 2014. 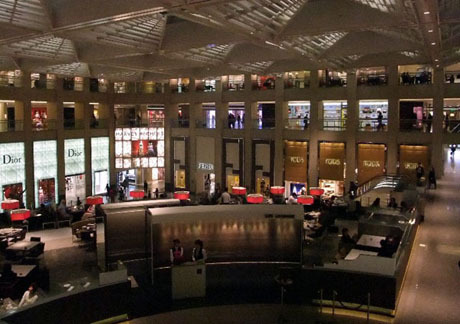 There are over 160 shops, restaurants and café’s, cinema, ice skating rink and the mall is also used as an occasional exhibition venue. Cityplaza 1 with six floors and Cityplaza 2 with four floors are connected by bridges at second floor level. Major stores include Wing On Department Store* on ground and first floor levels, Toys “R” Us on level three, Marks & Spencer on levels 1 and 2, and APiTA supermarket and household store on four floors from basement to level 2. There is a large selection of mainly mid-range shops offering ladies and mens fashion, children’s wear, casual wear, sportswear and equipment, footwear, beauty and personal care products, jewellery, books, stationery, toys and gifts, audio visual/music, arts and home furnishings. Shops include Laura Ashley, Esprit, Mango, Calvin Klein, Chickeeduck, Giordano, H&M, Levi’s, Quiksilver, Timberland, Crabtree & Evelyn, The Body Shop, MaBelle, City Chain, Broadway, Fortress World and Tom Lee Music. Taiwanese bookstore Eslite is opening its third Hong Kong store on two floors of Cityplaza in early 2016.There are over 25 restaurants ranging from McDonalds and The Spaghetti House to Chiuchow Garden Restaurant and Peking Garden Garden Restaurant. Cityplaza Ice Palace Ice Rink is located on the first floor and UA Cityplaza Cinema complex is on level five. For directory of stores see Cityplaza website. * Wing On Department Store closed at expiry of its current lease in August 2015. Taiwanese bookstore Eslite, which already has stores in Hong Kong in Hysan Place at Causeway Bay and Star House, Tsim Sha Tsui will open a 2-floor, 49,000 sq ft megastore "Eslite Spectrum" in the space currently occupied by Wing On in early 2016. OPENING HOURS – Opening/closing times of shops varies but generally from 10am to 9pm. Café’s and restaurants open various hours from between about 7am until midnight. GETTING THERE – MTR Tai Koo Station exit D or E. Also by bus - any bus travelling along King’s Road, Kornhill Road or Taikoo Shing Road including 2, 2A, 82, 85, 102, 110, 682, 682P, 720, 720A, M722, A12. By tram – all trams travelling to/from Shau Kei Wan or Sai Wan Ho Depot stop on King’s Road outside Tai Koo MTR Station. JUSCO – a large Japanese Department Store is located close to Cityplaza in Kornhill Plaza on Kornhill Road (Tai Koo MTR Station exit C). The store is a low/medium price “general household” store selling clothes, furniture, toys, stationery and books, electronic goods and computers and furniture. There is a large food hall with a large product range including fresh meat, fish and fruit and there is a food court with self-service restaurants and noodle bars. Jusco is open from 10am to 11pm daily (supermarket and catering open 8-30am to 11pm). Owned by Daily Eagle Development Ltd, a subsidiary of Wah Ha Realty Company Horizon Plaza is located in an industrial area of Ap Lei Chau, a small island connected by bridge to Hong Kong Island near Aberdeen. The building has been converted from a large warehouse into a retail outlet with over 150 shops spread over 28 floors. There are also three café’s and an Italian supermarket. Horizon Plaza attracts locals rather than tourists and is not very easily accessible although there are several “outlet” stores which may be of interest to tourists. When arriving at its office-style reception area with no sign of any shops visitors can be excused for believing they’ve arrived in the wrong place. With 28 floors and a small number of shops on each level this isn’t the ideal place for browsing and visitors wanting to explore may prefer to start at the top of the building and work downwards to avoid lengthy waits for the lifts. Range of products includes contemporary and traditional furniture, antique furniture, outdoor furniture and garden equipment, carpets, toys and baby accessories, beds, home accessories and gifts, fashion, pet accessories, pianos and food and wine. Major shops include Joyce Boutique (21/F), Lane Crawford Warehouse (25/F), Moiselle Warehouse (22/F), Max Mara Fashion Group Warehouse (27/F), Pompei Warehouse (22/F), Indigo Living (6/F flagship store and 18/F Indigo Modern), Beijing Antiques Shop (20/F), eco-chic furniture boutique Tree (28/F), Infurniti Lifestyles (26/F and 27/F) and Oriental Rugs (12/F). There are café’s on 2/F (Café Piatti), 10/F (Monde Chocolate et Café) and 28/F (Tree Café). Viva Italia Supermarket (11/F) has a large selection of sauces, pastas, desserts, wines and drinks. Horizon Plaza does not have an online directory of shops but visitors can obtain a printed directory (revised monthly) from the reception area inside the main entrance. OPENING HOURS – 10am to 7pm daily. Some shops may have different trading hours or close one day a week. Joyce Boutique is closed on Mondays. BUS 90 from Exchange Square Bus Station in Central (via Admiralty) approx every 10/15 mins to Ap Lei Chau Estate Bus Terminus (journey time approx 30 mins) or BUS 91 from Central Ferry Piers Bus Terminus in Central approx every 10/20 mins to Ap Lei Chau Estate Bus Terminus (journey time approx 30 mins). 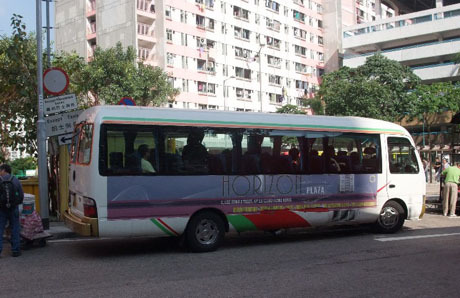 From Ap Lei Chau Estate Bus Terminus take FREE HORIZON PLAZA SHUTTLE BUS. Note - this free shuttle bus now operates only at certain times of year eg Christmas and New Yea - see Horizon Plaza website for details.The shuttle bus operates at intervals of 5 to 30 minutes depending on time of day and day of the week and the journey to Horizon Plaza takes about 5 minutes. At Ap Lei Chau Estate Bus Terminus there is no bus stop for the shuttle bus (minibus) but the bus stops next to the Citybus staff "hut" near the taxi rank. The FREE HORIZON PLAZA SHUTTLE BUS operates from 7-45am to 7-35pm Monday to Saturday and 9am to 7-30pm on Sundays and public holidays. However most shops do not open before 10am. Alternatively take bus 590 from Exchange Square Bus Station, Central to South Horizons (appx 30 mins). Disembark at Marina Square on South Horizons Drive (the fourth stop after the bus has crossed Ap Lei Chau Bridge) outside "The Oasis" and Space is just across the road. If uncertain where to get off stay on the bus until it reaches the terminus which is inside "The Oasis" (the bus passes "The Oasis" then makes a circuit of the one-way South Horizons Drive before coming back to "The Oasis" where it terminates at the bus station inside the building). From the terminus either take a taxi to Horizon Plaza (about 3 mins) or walk (about 10 mins). To walk from the Oasis Building walk towards the clearly visible “hill” to the junction with Lee Nam Road then follow Lee Nam Road around the waterfront round the hill past a petrol station and Hong Kong School of Motoring. 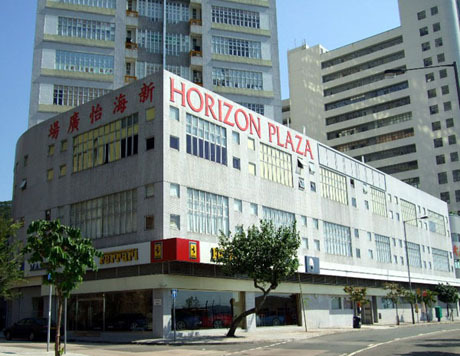 Horizon Plaza is just beyond the School of Motoring on Lee Wing Street. Alternatively on Lee Nam Road wait for either bus 95 (circular route around Ap Lei Chau - appx every 15 mins) or 671 (from Diamond Hill appx every 20 mins) both of which serve Horizon Plaza. If travelling from Causeway Bay take BUS 92 (Causeway Bay to Ap Lei Chau Circular via Happy Valley Racecourse, Leighton Road, Morrison Hill Road) approx every 12/20 mins to Ap Lei Chau Estate Bus Terminus then take FREE HORIZON PLAZA SHUTTLE BUS AS ABOVE. From Kowloon (Diamond Hill MTR Station), North Point (King’s Road), Fortress Hill (King’s Road) and Causeway Bay (Gloucester Road near World Trade Centre on World Trade Centre side of road) BUS 671 goes to Horizon Plaza. 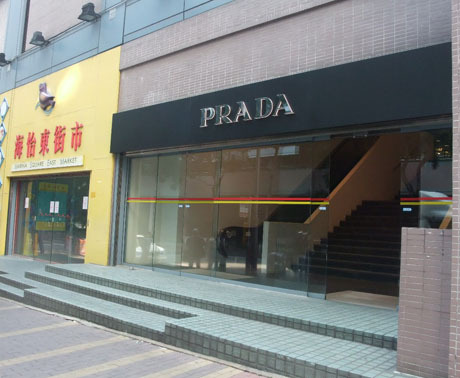 Space is the official outlet store for Prada. This store is rather strangely located in a mainly residential area but is more easily accessible than Horizon Plaza, being directly outside South Horizons MTR Station and also being served by the 590 and 590A bus routes. The store sells a range of mainly out-of-season fashion, shoes and accessories under the Prada, Prada Sport, Miu Miu and Helmut Lang brands. OPENING HOURS – 10-30am to 7-30pm Tuesday to Sunday. 12noon until 7pm Mondays and public holidays. BUS - Bus 590 from Exchange Square Bus Terminus, Central. Disembark at Marina Square on South Horizons Drive (the fourth stop after the bus has crossed Ap Lei Chau Bridge) outside "The Oasis" and Space is just across the road. If uncertain where to get off or if you miss the stop stay on the bus until it reaches the terminus which is inside "The Oasis" (the bus passes "The Oasis" then makes a circuit of the one-way South Horizons Drive before coming back to "The Oasis" where it terminates at the bus station inside the building). From Causeway Bay take Bus 592 from Moreton Terrace Bus Terminus (behind Hong Kong Central Library) approx every 10 mins to "The Oasis" bus station at Ap Lei Chau.